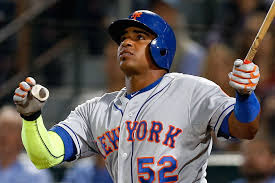 NEW YORK - Reportedly, Yoenis Cespedes has signed a 3 year 75M contract to remain with the New York Mets. The 30 year old Cuban outfielder hit. 287 with 14 doubles, four triples, 17 home runs, 44 RBIs and a .942 OPS in 57 regular-season games with the Mets in 2015.